Start off your visit on the 21st (Tue): explore the wealth of natural beauty at Pyha-Luosto National Park. For reviews, other places to visit, traveler tips, and tourist information, read Pyhatunturi trip planning app . Brisbane, Australia to Pyhatunturi is an approximately 29-hour flight. Due to the time zone difference, you'll gain 8 hours traveling from Brisbane to Pyhatunturi. Plan for colder temperatures traveling from Brisbane in May, with highs in Pyhatunturi at 12°C and lows at 1°C. Cap off your sightseeing on the 21st (Tue) early enough to travel to Salla. Salla is a municipality of Finland, located in Lapland. 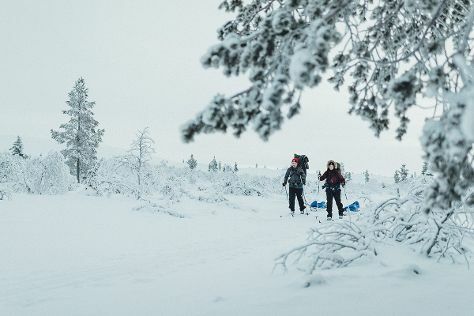 Start off your visit on the 22nd (Wed): fly down the slopes at Salla Ski Resort, then get a taste of local nightlife at Salla Museum of War & Reconstruction, and then steep yourself in history at Paikanselan Taistelualue. To find reviews, other places to visit, more things to do, and more tourist information, go to the Salla online vacation planner . Traveling by car from Pyhatunturi to Salla takes 2 hours. In May in Salla, expect temperatures between 11°C during the day and 1°C at night. Wrap up your sightseeing on the 22nd (Wed) to allow time to travel to Saariselka. Start off your visit on the 23rd (Thu): surround yourself with nature on a nature and wildlife tour, then look for gifts at Hippupuoti Gift Shop, and then explore the striking landscape of Urho Kekkonen National Park. Keep things going the next day: fly down the slopes at Saariselka Ski & Sport Resort. To find where to stay, reviews, ratings, and other tourist information, you can read our Saariselka trip itinerary builder app . Drive from Salla to Saariselka in 3.5 hours. Expect a daytime high around 11°C in May, and nighttime lows around 1°C. 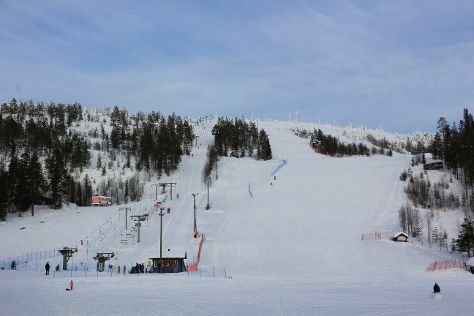 Finish your sightseeing early on the 24th (Fri) so you can travel to Levi. Get outdoors at Levi Ski Resort and Safaris. Take a break from Levi with a short trip to Pallas-Yllastunturi National Park in Muonio, about 58 minutes away. There's lots more to do: wander the streets of Ounasjoki - River for activities, admire all the interesting features of Ice Karting Levi, and stroll through Santa"s Cottage & Pet Farm. To see reviews, ratings, traveler tips, and more tourist information, refer to the Levi trip planner . Traveling by flight from Saariselka to Levi takes 3 hours. Alternatively, you can drive; or take a bus. In May, daily temperatures in Levi can reach 11°C, while at night they dip to 1°C. Wrap up your sightseeing on the 27th (Mon) early enough to drive to Rovaniemi. Kick off your visit on the 28th (Tue): take an exotic tour of a safari tour, take in the architecture and atmosphere at Rovaniemi Church, then take an in-depth tour of Arktikum, and finally don't miss a visit to Lordi's Square. Keep things going the next day: Head underground at Syvasenvaara Fell, examine the collection at Santa's House of Snowmobiles, then have fun at Santa Claus Office, and finally get in on the family fun at Santa Claus Village. For where to stay, other places to visit, traveler tips, and more tourist information, go to the Rovaniemi travel route planner . Drive from Levi to Rovaniemi in 2.5 hours. Alternatively, you can take a bus. In May, plan for daily highs up to 12°C, and evening lows to 3°C. Wrap up your sightseeing by early afternoon on the 30th (Thu) to allow enough time to travel back home.